Cook rice in 1/2 cup water as directed on package. In medium bowl, combine cooked rice, beef, celery, onion, seasoned salt and eggs; mix well. Spray 12-inch nonstick skillet with nonstick cooking spray. In sprayed skillet, add 3 cups of the coleslaw blend; spread to cover bottom of skillet evenly. Spoon beef mixture evenly over coleslaw blend; press lightly with fork or back of spoon. Top with remaining coleslaw blend. In small bowl, combine tomato sauce, brown sugar and vinegar; blend well. Spoon over mixture in skillet. Cover; cook over medium heat for 10 minutes. 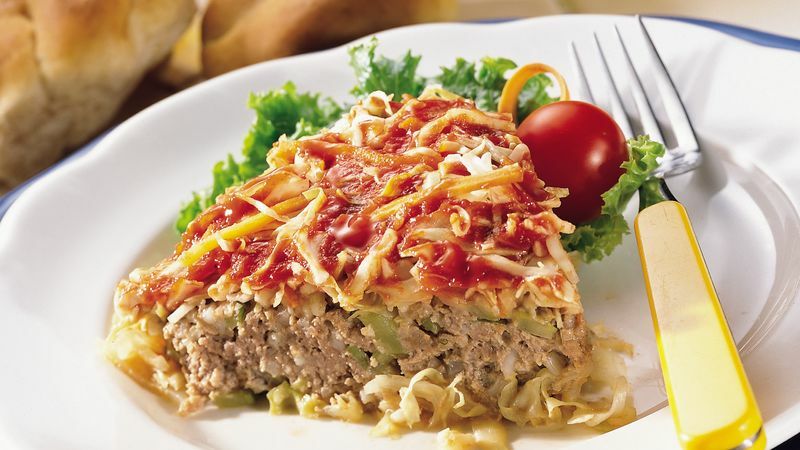 Uncover and reduce heat to medium-low; cook an additional 8 to 12 minutes or until beef mixture is thoroughly cooked. Remove skillet from heat. With cover partially on skillet, drain off liquid. Cut into wedges to serve. If desired, garnish with carrot curls or cherry tomato wedges.